Silica particles induce apoptosis in the lung, but it requires specific molecular mechanisms. It is typically mediated through a hierarchy of caspase activation. The activated caspase is governed by a coordinated hierarchy of initiator caspases (e.g., caspases 8 and 9) that activate effector caspase (e.g., caspase 3). These are responsible for apoptosis via proteolytic cleavage of homeostatic and structural proteins. Some protein from the tumor necrosis factor family such as myc and Fas (also called APO-1 or CD95) can trigger apoptosis. Apoptosis is mediated by Fas/Fas ligand (FasL) interaction, which is important to maintain the immune system against tolerance to antigens in silicosis. Thus, it is important to understand how silica induces caspase activation in silicosis, leading to subsequent apoptosis, which still remains unclear. It is better to understand the cellular pathway that is responsible for caspase activation. It is needed to explore apoptotic factors that are responsible for caspase activation in silicosis and potential factors that may be used as biomarkers for early diagnosis of silicosis. However, the use of biomarker can change, and greatly enhance, the process of risk assessment. Recently, considerable attention has been given by the scientific community to the utilization of biomarkers in the early diagnosis and prognosis of occupational diseases, which prevents further health deterioration in silicotic individuals. This review summarizes the role of different caspases in silica-induced apoptosis. It was reported that silica particles, but not quartz anatase titanium dioxide, activated caspase-3 in rat macrophages and caspases 1, 3, 6 and 9 in mouse AMs cell line (MH-S cells). , The in vitro model of silica-induced apoptosis shows that silica particles affect lysosomal membrane integrity by activation of intracellular pathways in mouse AMs, leading to caspase activation and apoptosis. The mitochondrial membrane permeability can be measured by the release of cytochrome c or depolarization of the inner mitochondrial membrane. Cyclosporin A, an inhibitor of mitochondrial permeability, decreased, partially, the mitochondrial depolarization as well as activation of caspases-3 and -9, indicating the possible mitochondrial dysfunction after silica exposure in vitro. , Increased expression of the antiapoptotic protein Bcl-xL, which is found in caspase cascade, suggested that macrophages may show prolonged survival in patients with chronic lung diseases. Although significant gaps in knowledge about caspases remain, cellular pathways leading to silica-induced caspase activation have partly been defined. Numerous studies have been performed by scientists related to ROS, RNS, tumor necrosis factor (TNF), nuclear transcription factor-kβ (NF-kβ) and oxidative stress in apoptosis, but fewer studies was carried out for caspases in silicosis. These findings suggest that apoptosis is an important form of cell death caused by silica exposure, in which the elevated ROS level may act as an initiator, leading to caspase activation and PARP cleavage to execute the apoptotic process. To understand the role of apoptosis in silicosis through the Fas/FasL interaction, scientists had taken samples from the broncheoalveolar lavage fluid and found the expression of Fas antigen, FasL by the apoptosis of cytotoxic effector and memory cells. In the pathogenesis of silicosis, the Fas/FasL system is implicated in the inflammatory process. Treatment with the procaspase inhibitor Z-VAD-FMK (Z, benzyloxycarbonyl; FMK, fluoromethylketone) significantly decreased lung fibrosis. Besides triggering apoptosis via caspase-8 activation, Fas engagement also induces secretion of IL-1b and IL-8, resulting in neutrophil extravasations, and supporting a major chemotactic role for FasL. It is possible that the generated substances counteract with the increase of cell number and regulate the silica-induced effects through the induction of apoptosis. It was demonstrated that high level of serum-soluble Fas (sFas) is found in patients with silicosis, systemic sclerosis (SSC) and systemic lupus erythematosus (SLE) without any clinical symptoms of autoimmune disease in peripheral blood mononuclear cells (PBMC). , Reduced expression of inhibitory genes for Fas-mediated apoptosis in PBMC derived from silicosis patients. These results and previous investigations indicated the existence of a lymphocyte fraction that is resistant to Fas-mediated apoptosis, suggesting the presence of two fractions of lymphocytes in silicosis patients. To prevent not only respiratory diseases but also immunological disorders in silicosis patients, further study into the role of Fas-mediated apoptosis in these patients is required. It seems that imbalance between apoptotic and proapoptotic factors could be responsible not only for immunologic disturbances and inflammation but also for internal organ involvement in the course of systematic sclerosis as well, just like in SLE. A new member of the human CARD-containing family of proteins, it has a high degree of homology to the CARD domain of caspase-1 and can bind to caspase-1 and its related proteins, pseudo-ICE and ICEBERG. CARD-8 attenuates ICE activity, thereby decreasing IL-1β secretion. A reverse transcriptase-polymerase chain reaction study revealed that CARD-8 has the same pattern of expression as caspase-1. CARD-8 can also negatively regulate NF-κB activation by diverse stimuli, suggesting that this protein may control cell survival. Consistent with these results, stable expression of CARD-8 sensitizes cells to differentiation-induced apoptosis. Furthermore, overexpression of CARD-8 can induce apoptosis in transfected cells. Although the precise function of CARD-8 is not clear, it was suggested that it may function as an adaptor molecule regulating caspase-1 activation (IL-1 β production), NF-κB activation and apoptosis. Therefore, Fas/FasL and caspase-mediated apoptosis in silicosis not only provide clues for the pathogenesis and treatment of immunological disorders but also aid in predicting the preclinical status of complicated autoimmune diseases found in occupational disease. Summary of the currently delineated cellular pathways leading to silica-induced apoptosis has been shown in [Figure 1]. The mechanisms of apoptosis involved in DNA adduction in silicosis have not been fully established. A group of cysteine proteases have been identified in both Caenorhabditis elegans (ced-3) and mammalian cells (caspases) as playing a critical role in the apoptotic process. ,., Among the various caspases, caspase-9 and caspase-3 appear to be involved in DNA adduction. , Procaspase-9 is an essential part of the "apoptosome," resulting in activation of caspase-9. , The activated caspase-9 cleaves caspase-3 to orchestrate the biochemical execution of apoptosis. Caspase-3 is one of the major effector caspases and plays a critical role in the characteristic apoptotic changes, including chromatin condensation, DNA fragmentation and formation of apoptotic bodies. It is observed that bcl-2 and Apaf-1 play an important role in the formation of apoptosome, leading to the activation of the caspase pathway. Recently, it was reported that low levels of Apaf-1 protein can determine sensitivity to apoptosis downstream of mitochondrial events, suggesting that regulation of Apaf-1 may be important for apoptosis regulation. However, it seems that caspase activation and subsequent apoptosis could still occur in an Apaf-1-dependent pathway. In addition, DNA fragmentation during apoptosis is mediated by a heterodimeric protein complex composed of DFF45/ICAD24) and DFF40/CAD/CPAN25). , These protein complexes are located downstream of caspase-3 to trigger DNA fragmentation and change the chromatin structure. But, it has been reported that DFF45 functions as an inhibitory factor in caspase-sensitive nuclease. In any case, DFF45 and CPAN possess regulatory activity for DNA fragmentation induced by caspase activation. , These indicate that caspases are involved in the apoptosis in different occupational diseases like pulmonary disorders, acute lung injury, diffused alveolar damage, idiopathic pulmonary fibrosis and other lung disorders caused by bleomycin, silica, endotoxin and the deposition of immune complexes. Immunoelectron microscopy revealed immunogold labeling for caspases 3 and 8 in the mitochondria with the accumulation of caspase-3 in the apoptotic bodies. Examination of the cells with electron microscopy confirmed that the active caspase-3-containing nuclei in the proliferative regions often had infoldings and appeared to be undergoing division. Some of the cells with active caspase-3-labeled nuclei in the bulb had synapses on their somata or dendrites. Labeled dendritic spines and a few axon terminals were also observed in the olfactory bulb. Thymus, spleen and lymph nodes were removed for the determination of caspase-3 expression by ELISA. We describe an ELISA for quantifying relative amounts of active caspase-3 in apoptotic cells. Expressions of survivin and caspase-3 in 101 cases of esophageal squamous cell carcinoma (ESCC) were quantitatively detected with flow cytometry. A highly sensitive flow cytometry-based cytotoxic T-lymphocyte (CTL) assay using the cleavage of caspase-3 in target cells as a readout. Flow cytometry detection of caspase-3 activation in preapoptotic leukemic cells. Immunohistochemistry was performed for the detection of expression of c-Myc and caspase-3 in the A375 cells. Expression of survivin and caspase-3 was evaluated using immunocytochemistry on oral cancer cells induced by staurosporine. Fluorescence-labeled inhibitor of caspases (FLICA) was used to detect caspase-3 activity in apoptotic cells in this project; cell morphology and caspase-3 sublocalization were determined by confocal microscopy. Apoptosis was assessed by immunofluorescent detection of the active form of caspase-3. this assay being validated with peripheral blood neutrophils. Terminal deoxynucleotidyl transferease-mediated dUTP-biotin nick end labeling (TUNEL) technique as well as immunohistochemical studies were used to evaluate the expression of caspase-3 and caspase-6 of breast cancer and the proliferation index. Apoptosis in various forms of lupus nephritis LN and its relationship to histomorphological changes and selected laboratory findings was studied using activated caspase-3 as a novel marker of apoptosis. Immunohistochemical analysis showed a marked induction of caspase-3 (p20) in every injured group compared with normal controls. To assess the underlying age-related changes in the cellular distribution of caspase-3, Scientist examined the motor cortex, cerebellum and hippocampus of young (4-year-old, n = 4) and old (20-year-old, n = 4) rhesus monkeys by immunohistochemistry. Expression of caspase-3, Bcl-2 and p53 was evaluated by immunohistochemistry in generalized aggressive periodontitis. Pattern of caspase-3 expression in noncancerous, premalignant (atrophic gastritis and intestinal metaplasia) tissue and cancer spots were analyzed under the same experimental conditions using immunohistochemistry. To detect apoptosis of germ cells and expression of caspase-3, TUNEL assay and immunohistochemistry (SABC) were used, respectively. Immunohistochemical expression was tested in 40 cases of BE, including 11 low-grade and 19 high-grade dysplasias (HGD), and samples were obtained from 40 surgical specimens of esophagectomy performed for HGD or Barrett's adenocarcinoma. Immunohistochemistry was used to detect the protein expression of COX-2 and caspase-3 in the bronchial endothelial cells. Immunohistochemistry was performed by a sensitive peroxidase-streptavidin method on formalin-fixed, paraffin-embedded myocardial infarction tissue using monoclonal antibodies against activated (cleaved) caspase-3. Semiquantitative immunohistochemistry revealed cleaved caspase-3-positive cells in human temporal lobe epilepsy (TLE) sections but not in controls. The cleaved caspase-3 immunohistochemistry detected apoptosis of the lymphoma cells most sensitively compared with TUNEL and ssDNA immunohistochemistry. Apoptotic rates were measured using hematoxylin and eosin morphological assessment and immunohistochemical staining with antibodies to activated caspase-3 and M30. Immunohistochemistry for activated caspase-3 and TUNEL was performed on the trigeminal ganglion after infraorbital nerve transection in newborn rats. Caspase-3 expression in human gastric carcinoma to clarify the clinicopathological importance and investigation of the apoptosis avoidance mechanism by an immunohistological method. Actual activation of caspase-3 was determined by immunohistochemistry using monoclonal antibody that recognizes only activated caspase-3. Apoptosis in normal lymphoid organs from healthy, normal, conventional pigs at different ages detected by TUNEL and cleaved caspase-3 immunohistochemistry in paraffin-embedded tissues. Formalin-fixed paraffin-embedded tissues from 56 cases of primary gastric malignant lymphoma and their adjacent nontumor mucosa were evaluated for PTEN and caspase-3 protein expression by streptavidin-biotin complex (SABC) immunohistochemistry. Immunohistochemistry (SP method) was used to determine the expression of caspase-3 and Bcl-2 in 52 cases of BTCC and 10 normal bladder mucosas. The intra-islet expression of caspase-3 in the NOD mouse was examined immunohistochemically following acceleration of the disease with cyclophosphamide. Caspase-3 expression was studied in adjacent epithelial cells, cancer cells and lymphocytes of primary foci and cancer cells of metastatic foci from 113 cases of gastric cancer by streptavidin-biotin-peroxidase (S-P) immunohistochemistry. Comparison of immunohistochemistry for activated caspase-3 and cleaved cytokeratin 18 with the TUNEL method for quantification of apoptosis in histological sections of PC-3 subcutaneous xenografts. Immunohistochemical localization of active caspase-3 in the mouse ovary: growth and atresia of small follicles. Immunohistochemical and biochemical assessment of caspase-3 activation and DNA fragmentation following transient focal ischemia in the rat. Caspase-3 expression was examined immunohistochemically using a polyclonal antibody that recognized uncleaved caspase-3 in pathologic stage I, nonsmall cell lung cancer. Measurement of apoptosis by immunohistochemistry using an antibody against the active form of caspase 3 is therefore reliable and correlates strongly with morphological assessment. Immunohistochemical analysis was performed on formalin-fixed paraffin-embedded sections to assess caspase-3 expression. Level of caspase-3 cleaved fragments was analyzed by Western blotting. Samples of the cerebral cortex, cerebellum, spinal cord and sciatic nerves were collected and examined for bcl-2, bax and caspase-3 expression using Western blotting. Liver MMP-9, TGF-beta1 and caspase-3 levels were quantified by Western immunoblotting. Western blot analysis was performed using antibodies against the pro- and active forms of caspase-3 and -9 or PARP in apoptosis of human granulosa-luteal cells. Caspase-3 in microparticles (EMP) from endothelial cells was studied using Western blot (n = 6) and flow cytometry (n = 6). Caspase-3 activity were determined by Western blot in 15 controls and 10 patients with benign prostatic hyperplasia and reported in a blinded fashion. To determine activation of the apoptotic regulatory cell proteins, caspase-3 and cleavage of PARP into its 85-kDa fragments were assessed by Western blotting. Western blot analysis was used to characterize the expression of caspase-3, caspase-8, PARP and p53 proteins in IM from 35 patients. Caspase-3 activation and PARP cleavage in lymphocytes exposed to Cr (III) complexes is revealed through Western blotting analysis. Active caspase-3 in the mucosa was detected according to the methods of immunohistochemistry and Western blotting. Immunohistochemistry and Western blot analyses were used to analyze the expression of caspase-3 in 40 archival specimens of patients with primary respected ESCC. In this review, we have summarized different biochemical pathways in which silica particle exposure can initiate apoptotic cell death of macrophages by the activation of caspases. 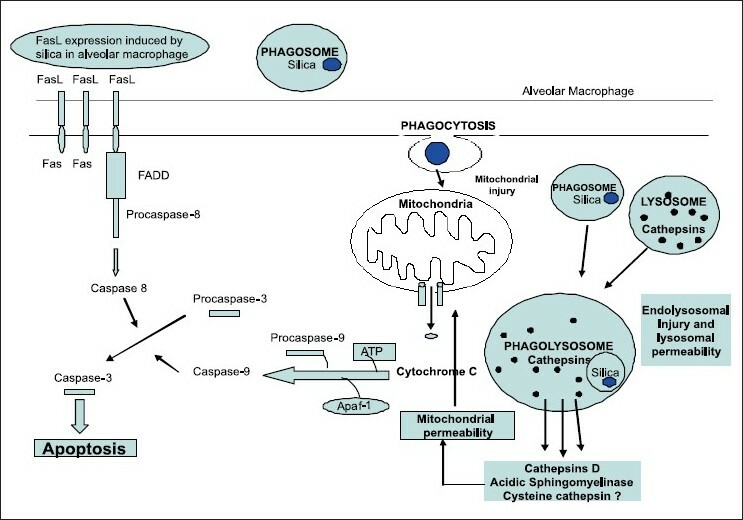 Apoptosis plays a central role in silicosis by activation of different caspase-mediated pathways, such as mitochondrial and cell surface death receptor (Fas /FasL) pathway. In future, the challenge ahead is to map the functions of newly found apoptotic proteins in the biochemical pathways that will allow us to better understand how the cell makes the decision between life and death. No significant data are available related to occupational exposure of silica particles, which leads to the activation of caspases in silicosis. An equally important task is to study how these pathways are modified in occupational diseases such as silicosis in which apoptosis dysregulation contributes to the pathogenesis of silicosis. Moreover, caspase may be used as a key effector molecule in which inflammatory processes and proteases are involved in remodeling of the extracellular matrix. High-resolution technology is available for the measurement of its activity in the biological samples such as broncheoalveolar lavage fluid, cerebrospinal fluid and blood samples of silicotic individuals, which may provide a beneficial tool to better understand the cellular and molecular pathways in silicosis. In future, it can be used as an effector biomarker for the prognosis of silicosis. Fas and FasL pathways are also involved in silicosis, indicating dysregulation of autoimmunity after long-term exposure to silica by the dysregulation in Fas and FasL pathways, which alter the autoimmunity in silicosis. FasL could play a role in the modulation of silica-induced inflammation in humans, providing a clue for the pathogenesis and treatment of this common and life-threatening occupational disease. Studies are available related to oxidative stress, ROS, RNS, TNF and NF-kβ, but this area is less approached by the scientists so far in caspase activation in silicosis. Measurement of the activity of caspases, Fas/FasL and Apaf-1 may open a new area for the early diagnosis of silicosis. During the course of this pursuit, novel proteins that currently do not belong to the known family members of apoptosis may be identified as antiapoptotic proteins, such bcl-2, which may be used as an effective biomarker for the study of occupational diseases. This review may help in better understanding caspase activation in silicosis and establishment of suitable biomarkers for screening the occupational diseases. Finally, it is possible that these basic scientific discoveries on apoptosis may reveal logical strategies for the discovery of new tools for the early diagnosis and prognosis of silicosis. 1. Davis GS. Pathogenesis of silicosis: current concepts and hypothesis. Lung 1986;164:139-54. 2. Shi X, Castranova V, Halliwell B, Vallyathan V. Reactive oxygen species and silica-induced carcinogenesis. J Toxicol Environ Health B Crit Rev 1998;1:181-97. 3. Castranova V, Vallyathan V. Silicosis and coal workers′ pneumoconiosis. Environ Health Perspect 2000;108:675-84. 4. Thornberry NA. Caspases: key mediators of apoptosis. Chem Biol 1998;5:R97-103. 5. Wyllie AH, Kerr JFR, Currie AR. Cell death: the significance of apoptosis. Int Rev Cytol 1990;68:251-6. 6. Thornberry NA, Bull HG, Calaycay JR, Chapman KT, Howard A, Ostura MJ, et al. A novel heterodimeric cysteine protease is required for interleukin-1b processing in monocytes. Nature 1992;356:768-74. 7. Fuentes-Prior P, Salvesen GS. The protein structures that shape caspase activity, specificity, activation and inhibition. Biochem J 2004;384:201-32. 8. Salvesen GS, Abrams JM. Caspase activation steppingon the gas or releasing the brakes? Lessons from humans and flies. Oncogene 2004;23:2774-84. 9. Lenardo M, Chan KM, Hornung F, McFarland H, Siegel R, Wang J, et al. Mature lymphocyte apoptosis: immune regulation in a dynamic and unpredictable antigenic environment. Annu Rev Immunol 1999;17:221-53. 10. Krammer PH. CD95′s deadly mission in the immune system. Nature 2000;407:789-95. 11. Porter DW, Ye J, Ma J, Barger M, Robinson VA, Ramsey D, et al. Time course of pulmonary response of rats to inhalation of crystalline silica: NF-kB activation, inflammation, cytokine production, and damage. Inhal Toxicol 2002;14:349-67. 12. Sarih M, Souvannavong V, Brown SC, Adam A. Silica induces apoptosis in macrophages and the release of interleukin-1a and interleukin-1b. J Leukoc Biol 1993;54:407-13. 13. Iyer R, Hamilton RF, Li L, Holian A. Silica induced apoptosis mediated via scavenger receptor in human alveolar macrophages. Toxicol Appl Pharmacol 1996;141:84-92. 14. Iyer R, Holian A. Involvement of the ICE family of proteases in silica-induced apoptosis in human alveolar macrophages. Am J Physiol 1997;273:L760-7. 15. Hakem R, Hakem A, Duncan GS, Henderson JT, Woo M, Soengas MS, et al. Differential requirement for caspase-9 in apoptotic pathways in vivo. Cell 1998;94:339-52. 16. Kuida K, Haydar TF, Kuan CY, Gu Y, Taya C, Karasuyama H, et al. Reduced apoptosis and Cytochrome- C mediated caspase activation in mice lacking caspase-9. Cell 1998;94:325-37. 17. Yoshida H, Kong YY, Yoshida R, Elia AJ, Hakem A, Hakem R, et al. Apaf1 is required for mitochondrial pathways of apoptosis and brain development. Cell 1998;94:739-50. 18. Cecconi F, Alvarez-Bolado G, Meyer BI, Roth KA, Gruss P. Apaf1 (CED-4 homolog) regulates programmed cell death in mammalian development. Cell 1998;94:727-37. 19. Shen HM, Zhang Z, Zhang QF, Ong CN. Reactive oxygen species and caspase activation mediate silica induced apoptosis in alveolar macrophages. Am J Physiol Lung Cell Mol Physiol 2001;280:L10-7. 20. Langley RJ, Kalra R, Mishra NC, Hahn FF, Razani-BS, Singh SP, et al. A biphasic response to silica I. Immunostimulation is restricted to the early stage of silicosis in Lewis rats. Am J Respir Cell Mol Biol 2004;30:823-9. 21. Hannothiaux MH, Scharfman A, Wastiaux A, Cornu L, Van Brussel E, Lafitte JJ, et al. An attempt to evaluate lung aggression in monkey silicosis: hydrolases, peroxidase and antiproteases activities in serial broncheoalveolar lavages. Eur Respir J 1991;4:91-204. 22. Leigh J, Wang H, Bonin A, Peters M, Ruan X. Silica induced apoptosis in alveolar and granulomatous cells in vivo. Environ Health Perspect 1997;105:1241-5. 23. Liying W, Linda B, Yongju L, Yon R, Robert RM, Vince C, et al. Essential role of p53 in silica-induced apoptosis. Am J Physiol Lung Cell Mol Physiol 2004;288:488-96. 24. Borges VM, Lopes MF, Falcγo H, Leite-Jϊnior JH, Rocco PR, Davidson WF, et al. Apoptosis underlies immunopathogenic mechanisms in acute silicosis. Am J Respi Cell Mol Biol 2002;27:78-84. 25. Vallyathan V, Leonard S, Kuppusamy P, Pack D, Chzhan M, Sanders SP, et al. Oxidative stress in silicosis: evidence for the enhanced clearance of free radicals from whole lungs. J Mol Cell Biochem 1997;168:125-32. 26. Li P, Nijhawan D, Budihardjo I, Srivasula SM, Ahmad M. Cytochrome C and dATP- dependent formation of Apaf- 1/ caspase-9 complex initiates an apoptotic protease cascade. Cell 1997;91:479-89. 27. Chao SK, Hamilton RF, Pfau JC, Holian A. Cell surface regulation of silica-induced apoptosis by the SR-A scavenger receptor in a murine lung macrophage cell line (MH-S). Toxicol Appl Pharmacol 2001;174:10-6. 28. Thibodeau M, Giardina C, Hubbard AK. Silica induced caspase activation in mouse alveolar macrophages is dependent upon mitochondrial integrity and aspartic proteolysis. Toxicol Sci 2003;76:91-101. 29. Michael ST, Charles G, David AK, Joseph H, Andrea KH. Silica-induced apoptosis in mouse alveolar macrophages is initiated by lysosomal enzyme activity. Toxicol Sci 2004;80:34-48. 30. Ferri KF, Kroemer G. Organelle-specific initiation of cell death pathways. Nat Cell Biol 2001;3:255-63. 31. Tomita K, Caramori G, Lim S, Ito K, Hanazawa T, Oates T, et al. Increased p21 (CIP1/WAF1) and B cell lymphoma leukemia-x (L) expression and reduced apoptosis in alveolar macrophages from smokers. Am J Respir Crit Care Med 2002;166:724-31. 32. Shangary S, Lerner EC, Zhan Q, Corey SJ, Smithgall TE, Baskaran R. Lyn regulates the cell death response to ultraviolet radiation through c-Jun N terminal kinase-dependent Fas ligand activation. Exp Cell Res 2003;289:67-76. 33. Kim N, Andreas S. Caspases signal not only apoptosis but also antigen-induced activation in cells of the immune system. Genes Dev 2003;17:819-25. 34. Arai H, Gordon D, Nabel EG, Nabel GJ. Gene transfer of Fas ligand induces tumor regression in vivo. Proc Natl Acad Sci USA 1997;94:13862-7. 35. Agnes H, Jamel A, Hedia G, Kamel H. Expression of Fas antigen and Fas ligand in bronchoalveolar lavage from silicosis patients. Mediators Inflamm 2003;12:209-14. 36. DosReis GA, Borges VM, Zin WA. The central role of Fas-ligand cell signaling in inflammatory lung diseases. J Cell Mol Med 2004;8:285-93. 37. Widlak P. The DFF40/CAD endonuclease and its role in apoptosis. Acta Biochim Pol 2000;47:1037-44. 38. Takemi O, Megumi M, Shuko M, Hiroiki H, Yoshie M, Masayasu K, et al. Immunological effects of silica and asbestos" Cell Mol Immunol 2007;4:261-8. 39. Lenardo M, Chan KM, Hornung F, McFarland H, Siegel R, Wang J, et al. Mature lymphocyte apoptosis: immune regulation in a dynamic and unpredictable antigenic environment. Annu Rev Immunol 1999;17:221-53. 40. Krammer PH. CD95′s deadly mission in the immune system. Nature 2000;407:789-95. 41. Griffith TS, Brunner T, Fletcher SM, Green DR, Ferguson TA. Fas ligand-induced apoptosis as a mechanism of immune privilege. Science 1995;270:1189-92. 42. Thome M, Tschopp J. Regulation of lymphocyte proliferation and death by FLIP. Nat Rev Immunol 2001;1:50-8. 43. Valeria MB, Haroldo F, Josι H, Leite-Jϊnior LA, Gerlinde P, Teixeira, MR, Alberto F, Nσbrega, M F, Lopes PM, Rocco WF, Davidson RL, Hideo Y, Walter AZ, George AD. Fas Ligand Triggers Pulmonary Silicosis. J Exp Med 2001;194:155-63. 44. Seino K, Kayagaki N, Okumura K, Yagita H. Antitumor effect of locally produced CD95 ligand. Nat Med 1997;3:165-70. 45. Buhling F, Wille A, Rocken C, Wiesner O, Baier, A, Meinecke I, et al. Altered expression of membrane-bound and soluble CD95/Fas contributes to the resistance of fibrotic lung fibroblasts to FasL induced apoptosis. Respir Res 2005;6:37. 46. Tomokuni A, Otsuki T, Isozaki Y, Kita S, Ueki H, Kusaka M, et al. Serum levels of soluble Fas ligand in patients with silicosis. Clin Exp Immunol 1999;118:441-4. 47. Otsuki T, Sakaguchi H, Tomokuni A, Aikoh T, Matsuki T, Kawakamit Y, et al. Soluble Fas mRNA is dominantly expressed in cases with silicosis. Immunology 1998;94:258-62. 48. Takemi O, Akiko T, Haruko S, Fuminori H, Masayasu K, Ayako U. Reduced Expression of the Inhibitory Genes for Fas-Mediated Apoptosis in Silicosis Patients J Occup Health 2000;42:163-8. 49. Marjaneh R, Srinivasa M. Srinivasula, Lin W, Jean LP, Brad J, et al. CARD-8 Protein, a New CARD Family Member That Regulates Caspase-1 Activation and Apoptosis. J Biol Chem 2002;277:13952-8. 50. Budihardjo I, Oliver H, Lutter M, Luo X, Wang X. Biochemical pathways of caspase activation during apoptosis. Annu Rev Cell Dev Biol 1999;15:269-90. 51. Cohen GM. Caspases: the executioners of apoptosis. Biochem J 1997;326:1-16. 52. Thornberry NA. Caspases: key mediators of apoptosis. Chem Biol 1998;5:R97-103. 53. Kuida K. Caspase-9. Int J Biochem Cell Biol 2000;32:121-4. 54. Porter AG, Janicke RU. Emerging roles of caspase-3 in apoptosis. Cell Death Differ 1999;6:99-104. 55. Green DR, Reed JC. Mitochondria and apoptosis. Science 1998;281:1309-12. 56. Li P, Nijhawan D, Budihardjo I, Srinivasula SM, Ahmad M, Alnemri ES, Wang X. Cytochrome c and dATP-dependent formation of Apaf-1/caspase-9 complex initiates an apoptotic protease cascade. Cell 1997:91:479-89. 57. Phil D. Apoptosis Basic Medical Sciences, St. George′s University of London. Available from: http://www.sgul.ac.uk/dept/immunology/dash. 58. Chafké A, Belmokhtar CA, Josette H, Charles D, Susana F, Maria F, et al. Apoptosome-independent pathway for apoptosis: Biochemical analysis of Apaf-1 defects and biological outcomes. J Biol Chem 2003;278:29571-80. 59. Liu X, Zou H, Slaughter C, Wang X. DFF: a heterodimeric protein that functions downstream of caspase-3 to trigger DNA fragmentation during apoptosis. Cell 1997;89:175-84. 60. Halenbeck R, MacDonald H, Roulston A, Chen TT, Conroy L, Williams LT. CPAN, a human nuclease regulated by the caspase-sensitive inhibitor DFF45. Curr Biol 1998;8:537-40. 61. Inohara N, Koseki T, Chen S, Wu X, Nunez G. CIDE, A novel family of cell death activators with homology to the 45 kDa subunit of the DNA fragmentation factor. EMBO J 1998;17:2526-33. 62. Liu X, Li P, Widlak P, Zou H, Luo X, Garrard WT, et al. The 40-kDa subunit of DNA fragmentation factor induces DNA fragmentation and chromatin condensation during apoptosis. Proc Natl Acad Sci USA 1998;95:8461-6. Wang, Y., Fu, W., Wang, H., Liang, Y., Wang, Y., Yao, W., Chen, W., (...), Peng, W.
Yao, S.-Q., Rojanasakul, L.W., Chen, Z.-Y., Xu, Y.-J., Bai, Y.-P., Chen, G., Zhang, X.-Y., (...), He, Q.-C.